In December 1977, Steve McQueen wrote the owner of one of two Mustangs used in the iconic chase scene from Bullitt. “Again,” McQueen wrote, “I would like to appeal to you to get back my ‘68 Mustang.” But he was rebuffed and, for nearly 40 years, the car pretty much disappeared. It was sitting in various states of disrepair until its owner, who inherited it from his father, contacted Ford in 2016. The timing was perfect; Ford was planning to introduce a 2019 Bullitt Mustang to celebrate the movie’s 50th-ish anniversary. Journalist Larry Webster has the complete story over at Hagerty.com. The most satisfying part has to be McQueen, a notorious dirtbag, getting turned down in his attempts to get his Mustang back. The car had passed through two other buyers before an insurance executive named Bob Kiernan bought it in the mid-’70s. Not long after, McQueen himself came calling. But Bob was steadfast in keeping it. The owner was just fine with forgetting it, and then the Bullitt Mustang made an exit, stage left, from recorded history. Bob Kiernan mostly used a company car to get around, which left the Bullitt Mustang for his wife to use as a daily driver. “The Bullitt likes to drink the gas,” she said back then. In 1980, the car’s clutch went out, and with 65,000 miles on the clock, it was moved into the garage, for what turned out to be a long stay. After that the Mustang mostly sat in the various places Bob Kiernan lived around the country, first starting in New Jersey, then Ohio, then Kentucky, and, finally, Nashville, with various false starts in trying to get it back in shape. Finally, Bob’s son Sean Kiernan got Ford involved, who were eager to unveil the original alongside the 2019 Bullitt Mustang at the Detroit Auto Show. Webster was given access ahead of that unveiling, though everyone tried to keep a veil of secrecy, since, as Webster says, this was something like an automotive Holy Grail. What he saw sounds like it could use some work. I lie on the floor to get a look at the underside. The only shiny bits are new brake lines and a few bolts. The welded camera bars still jut out from both rockers; the original custom exhaust is still in place. The rear axle with its 4:10 gear ratio and limited-slip differential doesn’t have the usual oil coating. 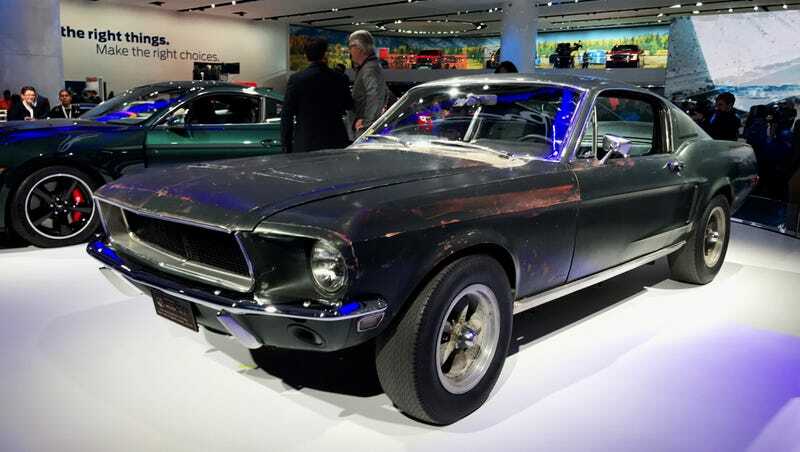 Even with all of its issues, Kiernan’s Mustang is in significantly better shape than the other Mustang used in the movie, which was recovered in Mexico in March 2017. That car had been extensively stripped for parts and restored, making Kiernan’s the more valuable of the two, a value, some think, is probably in the millions. You can read Webster’s full story here. Did The Rock Just Accidentally Leak Ford&apos;s New Bullitt Mustang?